We have some very exciting news to share with you. Over the past several years we have heard your requests for a user-friendly online ordering solution. Today, we are proud to announce that online ordering through our website is officially here. No more tedious desktop software updates that take hours. Quicker access and capability to order from multiple devices. This was a large project and we are thrilled to take a major step in making your life easier. We will continue to maintain the desktop versions of all of our software options, but we hope you take an opportunity to explore our newest feature. To get started, visit your desired product and click the blue ‘Order Now’ button. Please feel to reach out to our team with any questions or feedback that you may have. We sincerely look forward to seeing your orders come through the lab. Wonderful! Congrats on the new feature! This is great news! So excited to us the online system instead of Roes! I COULD NOT BE HAPPIER ABOUT THIS! You guys are awesome! This is SO exciting! I knew that Millers would come through on this update! Thank you! So can I delete the Roes and Designer Plus software now? ITs not working. I want to order 5×7 prints and I added prints to the folder and nothing happens. Can click add to cart. There is a red diagonal cross. Sorry for the difficulties you’ve run into, Michelle. Please let us know if the problems persist. Hi Lynn. Yes, you can delete the ROES and D+ software from your desktop now and place orders directly through the site. If you find web ordering doesn’t offer everything you are used to seeing in the desktop ordering solutions, please let us know so we can improve the experience. Thanks for letting us know, Johanna. Keep us posted if you run into any more issues. I’m so excited about this! I’m trying to order some photo ornaments for clients, and ROES keeps freezing. Will I be able to order these via the web? Currently, I don’t see a blue “order now” button. Thanks for all your work on this! Hi Tracey. We don’t have web ordering for Sports & Events and Schools products at this time, but we do for nearly all other product categories. I see new and improved features on your web ordering software, but there also seem to be some things missing. Like many of the backgrounds and scrapbook stickers. Do I have the ability to add my own backgrounds? Can I make my own page templates to save and use for future albums? I also don’t see a way to change the opacity of an image or background. I love that the background can be added to one or all of the pages at the same time. The borders are easier to use. Can I choose to add the borders to all the images at the same time so they will all be the same? I don’t see the measure tool. Is there a way to make sure the boxes are all the same size? Hi Barbara. Thank you for letting us know about the additional backgrounds and scrapbook items. They are now enabled, so you should see them now. For the more robust design features, such as adding backgrounds, templates, alignment tools, etc, the Designer Plus desktop application is still more suitable. There is an ‘Opacity’ button visible when a background or an image is selected, but adding borders to all images simultaneously is not an option in either application. In ROES I can order multiple sizes of one type of item. Can I do that in web ordering? For example can I order 5×7 and 4×6 cards in one order? Just placed my first web order and it was super easy and fast. Aww I wish I had known this before ordering. Took me a minute to get my order together through ROES. Looks like great new feature though. Will be using it soon! How did you guys even find the web ordering? I’m not seeing it. This is great news but you can only order one item at a time even of the same product only one item can be ordered. Is there a way to allow multiple items? It would be so much faster. In addition, you have to login each time even if clicking remember me and there is no way to go back to the online order portal from the shopping cart. Maybe add a button place another order or something. Hopefully these suggestions will be updated. I’m really excited about the changes though! Hi Shana, if you go to any of our product pages there is a blue “Order Now” button! Will I be able to see my order history on the new website feature if I ordered in the past through the old systems? Hi Roxanne. Regardless of if you order through our website or through our desktop software, your orders will show in your order history on the website. Thanks for the suggestions, Lynette. We’ll pass these along to our development team. Hi Michael. We sincerely apologize about this. We have passed your comment along to our development team to look into. Hi Kat. It depends on the product. 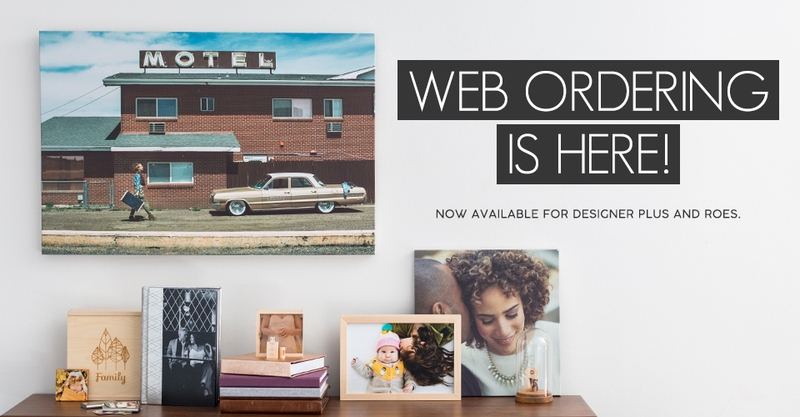 For Prints, Dream Prints, Proofing, Wall Art, and Banners/Signage, you can order multiple sizes of one product type in the same order through web ordering. Unfortunately for other products like Cards, you are not able to order multiple sizes of one product in the same order through web ordering. Thanks so much for the feedback, Donna. Hi everyone! I can’t seem to find how to create proofs in the album ordering! Can you please help?